...drones in shooting boats for photos and videos. We’re boasting two innovations in presenting this month’s content to you, both centered on our cover. We normally photograph cover boats from a helicopter, but the Malibu M235 gracing this issue’s cover was shot utilizing a drone. These days, using a drone for photography might appear to be a no-brainer, but the fact is the situation needs to be just right for a drone to make sense. The boat needs to be going slow enough so the drone can match speed with the boat so a blur-free still image can be shot. Still images are much more demanding in this regard than video. Moreover, most new boats don’t look right until they are up and running at 30 or more miles per hour. Such speed delivers a bow-up attitude, ensures the stern isn’t dragging, and shows some of the boat’s bottom. It also adds energy and excitement to the image that one can feel, especially if the viewer is a boater to begin with. But higher speeds can outrun many drones and, at the least, cut down on the amount of time they can remain airborne. Then there’s the drone pilot. How do we get the shot without including the pilot in the shot? Answer: We need another boat to chase the cover boat, which is not that big of a deal — the expense is similar to that of hiring a helicopter. But we often shoot on the ocean, and even on a calm day, the motion at the speed required makes it difficult to control the drone with precision. If any group can understand the challenge of manipulating a mini-joystick while watching a cellphone screen at planing speed in ocean swells, it’s you, Boating readers. But for this issue we bring you the stunning Malibu M235. A watersports boat, it shows best doing what it was designed to do: make great wakes and waves for its crew to ride. Wakesurfing happens at a very drone-friendly 11-or-so mph. The photo shoot took place on a lake, the boat’s natural element. And because of the specifics of wakesurfing, we were able to incorporate innovation number two on this cover: showing watersports in action. Unlike tubing, water skiing or wakeboarding, wakesurfing occurs close to the boat’s transom. That allowed us to frame a shot to include both boat and rider at a size where the boat can still be seen in some detail (that’s why we use aerial photography for you in the first place). I’d like to thank Garrett Cortese for spearheading this exciting cover as well as other content in this Watersports Issue. Though Cortese is the editorial director of our parent company’s Watersports Group, he is also now a newly minted member of Boating’s editorial team. He joins Pete McDonald, Jim Hendricks, Randy Vance and a host of other experienced professionals who are privileged to bring you the best boating content on the planet. Takeaway: Drones are known as UAV:Unmanned Aerial Vehicle and require a license to fly for commercial purposes, such as a BOATING cover shoot. We wonder when boat drones will come on the scene? Will we call them UMV (Unmanned Marine Vehicle)? Excellence In Customer Satisfaction For Forest River Marine! Forest River Marine is proud to be recognized by the NMMA (National Marine Manufacturers Association) for consecutive years as a recipient of the Marine Industry CSI Award. Forest River Marine has achieved and maintained an independently measured standard of excellence in customer satisfaction. This award demonstrates that Forest River Marine builds the highest quality products, and is focused on the needs and satisfaction of the customer by providing them with exceptional customer service and the best warranty in the industry. ...on Lake Greeson is proud of its heritage of offering the most dedicated staff at one of the finest of Arkansas lake resorts. If you’re looking for a vacation in Arkansas, our Lodge & Resort is your answer. Everything is in place for Self Creek Lodge and Marina to offer our guests a wonderful family vacation in Arkansas at Lake Greeson. We offer year-round events and activities to make your lakeside vacation memorable, fun, and carefree. Our marinastore offers over 2,400 square feet of display and retail area – there’s even a cozy dining area where guests can look out onto the lake and enjoy a plump juicy hot dog fresh off the grill, a delicious pizza, or other great lake snacks. Fishing supplies, lake necessities, sportswear, marine and boating supplies are offered as well as fuel, bait and ice. Friendly and helpful staff greet guests at the fueling tee or behind the spacious oak counter. Outside, a cool, shady patio beckons with comfortable, lake-side seating – the perfect perch for enjoying ice cream! The resort offers a wide range of covered and uncovered slips for boat storage of every size in a clean, well-maintained marina basin. A full rental fleet includes late model party barges and ski boats. From across the water, cozy, Arkansas lakeside cabins offer lakers a peek at casual, rustic luxury. The cabins feature spacious rooms, a stone fireplace, fully equipped kitchen and beautiful furnishings in an eclectic blend of antiques and comfortable, contemporary pieces. From the beautiful area rugs and unique accessories and artwork in each unit to the bubbling hot tubs on the back decks, these Arkansas lakeside cabins have been designed to offer every comfort and delight for visitors to the lake. Jim and the Self Creek staff are eager to welcome you to their home on Lake Greeson! Jim, Lori and family live on the grounds to offer visitors the kind of warm, personal service that makes Self Creek one of the most popular of all Arkansas lake resorts, and one of the top choices by families across the South. Self Creek Lodge and Marina is part of the Tri-Pennant Family of Resorts, spanning two other Arkansas wilderness lakes and offering more of the premier luxury that you’re used to at Self Creek. Visit Iron Mountain Lodge and Marina on nearby DeGray Lake, and don’t miss Mountain Harbor Resort and Spa on nearby Lake Ouachita. All three resorts within the Tri-Pennant Family offer the same excellent customer service and memorable destination vacation experience that you deserve in a vacation. The families of the Tri-Pennant Families love to serve yours – and treat you like their own. Mercury Makes News In Miami With The Loaded Harris! The demo ride on the Grand Mariner began by uttering the common phrase, “Hey Siri,” and after asking the voice-controlled personal assistant to start the engines, the twin 300 V8s began to purr. How’s that for an advancement in technology! The simplified one integrated system made this Harris a popular choice for journalists during our weekend of testing. Technologies such as CZone digital control and monitoring truly simplify the operation of your pontoon. It gives you complete control of all electrical functions with the touch of a button. We were able to control the lights, stereo and other functions with ease. Plus CZone has a proven reputation for reliability with over 10 years of experience in marine installations. 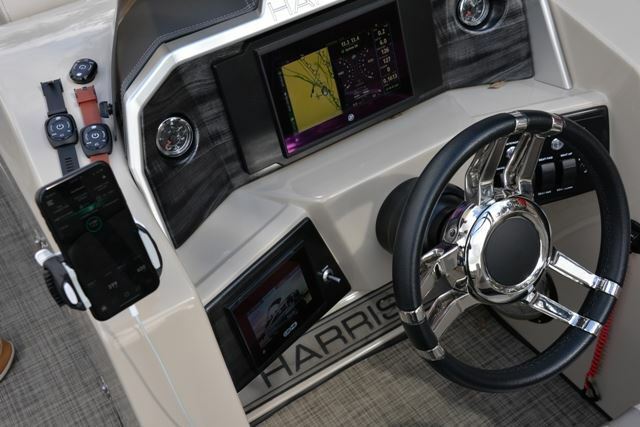 Other key features on this Harris included Mercury’s VesselView, a multi-function display that has more information and data on boat and engine functions than you’re going to find anywhere else including rpm, speed, fuel flow and efficiency, temperature, trim and more. With direct integration into Mercury’s propulsion systems, VesselView has the ability to control the engine. Features such as trolling for fish, pulling tubers, adjusting skyhook, setting cruise control and others can be easily controlled from the VesselView screens. And if you’re not an expert, don’t worry. VesselView will make you feel like you’re one. And if that’s not enough, VesselView Mobile brings all that power to your mobile device as well as even more ways to stay connected. Another new technology we were able to experiment with on this pontoon came from a partnership with FELL Marine, a leader in marine wireless technology. 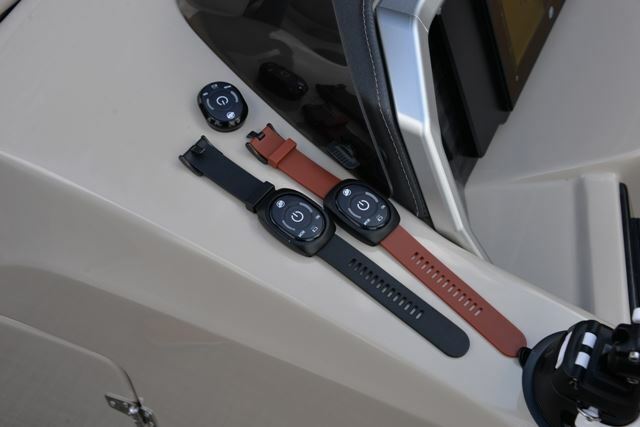 Mercury Marine co-develops exclusive wireless and IOT connected products that seamlessly integrate with Mercury’s SmartCraft suite of digital technology and CZone digital switching, to make boating easier, safer and more enjoyable than ever before. Utilizing a wearable FOB, in the event of a Man-Over-Board (MOB) situation, the engines turn off and an alarm sounds. Emergency contacts can also be programmed to be contacted after a specific time that you set, and another safety feature we like is the lights on the boat start blinking “SOS” as an added precaution. If it was a passenger who fell over, the engines can be started immediately to return to the location that was automatically marked on the screen. The assisted docking system that is based on aerospace control systems and autonomous-car artificial intelligence, was another exciting announcement Mercury announced prior to the Miami Boat Show. At Lake X, the system was demonstrated on a Boston Whaler 330 Outrage with twin Mercury Verados and Joystick Piloting for Outboards. Mercury collaborated with Raymarine to incorporate Raymarine’s DockSense system, which uses vision technology to sense and identify potential obstacles on the boat’s course, providing feedback to the Mercury autonomous system to allow the JPO system to respond. It’s the industry’s first intelligent object recognition and motion sensing assisted docking solution, and with DockSense, it continuously monitors the vessel’s surroundings, keeping the autonomous system updated with real-time detection of objects like pilings or another vessel. As journalists, we each took a turn attempting to run into a nearby dock or seawall, and the system simply overrides you and won’t allow you to do it. As we were just idling and talking, we got within the preset radius of a dock, and the engines automatically revved up and kept us at a safe distance. When we were ready to dock, we simply pressed a button to turn off the sensor on one side and then used the Joystick to perfectly line us up. The DockSense system includes multiple FLIR machine vision cameras, a central processing module and the DockSense app running on Raymarine’s Axiom navigation display. It’s still being developed, but it does bring some excitement to what we can expect in the future.